Hrithik Roshan is considered as the most charming and handsome hero in Bollywood. He has unique style of dancing and acting which appeals viewers in India and abroad. His captivating personality, screen charisma, handsome appearance, and astonishing dancing skills make him an extraordinary hero of Bollywood. Hrithik Roshan entered film industry and his first film was AASHA where he played a child artist role. As adult he debuted in 2000 in “Kahonaa Pyaar Hai” which was a blockbuster film. He bagged his Filmfare Awards for Best Actor and Best Male Debut for this film that turned his career to the top. Looking at his biographical sketch, Hrithik was born in a family of stars. His father is Rakesh Roshan, famous actor of his time and his mother is Pinky Roshan. He is married to his childhood friend Suzanne Khan, daughter of famous star Sanjay Khan. They have two sons Hrehaan and Hridhaan. Hrithik Roshan has given many super hit movies and his acting is appreciated by the audience. So far he had a very successful run in the film industry and he got accolade for his good acting in many of his films. He received critical acclamation for his performance in Jodhaa Akbar, in which he played the role of historical figure Akbar the Great. He also received an International award for this film at the Golden Minbar International Film Festival. His acting in the melodrama ‘Kabhi Khushi Kabhie Gam’ was much appreciated by the audience. The film became a blockbuster in India as well as in overseas market and generated huge revenue. He worked very hard in his grand project “Kites” but it flopped at the box office.His other famous movies are Koi Mil Gaya and its follow-on Krrish that won him several Best Actor awards. 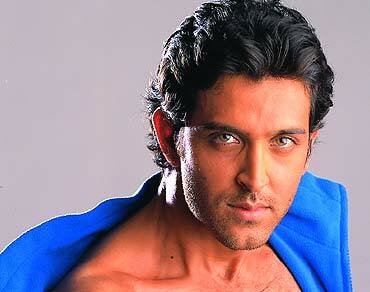 Roshan received Filmfare Award for Best Actor in 2006 for Dhoom 2. These achievements made him super star in Hindi cinema. He has a wax figure at Madame Tussauds Wax Museum making him the fifth Bollywood actor who has been simulated as a wax statue. Hrithik Roshan is currently working on the ambitious film Krrish 3, directed by Rakesh Roshan in which he has a marvellous role. Film reports indicate that Hrithik will act triple role in the film. Hrithik and Priyanka will appear in their same roles from Krrish while Vivek Oberoi will act in negative role. The movie will be released on the occasion of Diwali in 2013. It is anticipated that Krrish 3 will break many records in Bollywood. 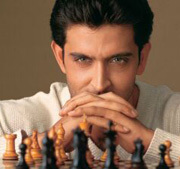 Presently, Hrithik is engaged in shooting of ‘Bang Bang’, a remake of Tom Cruise’s Knight and Day. While reviewing acting and career of Hrithik Roshan, it can be said that this hero has outstanding personality. His best attribute is that he has got excellent dancing skills. Mumbai, April 12 (IANS) Within minutes of the trailer launch of "Student Of The Year 2", starring actor Tiger Shroff and glamorous debutantes Ananya Panday and Tara Sutaria, Twitter turned into a meme ground with some social media users asking "where are such schools" and "why so much action". View More..
Mumbai, March 31 (IANS) Actress Minisha Lamba says the #MeToo movement should not be trivialised and that women should stand by each other in solidarity. View More..
Mumbai, March 21 (IANS) Bollywood actors including Madhuri Dixit Nene, Akshay Kumar, Hema Malini and Hrithik Roshan on Thursday sent out Holi wishes to their fans, urging them to enjoy a safe and happy festival of colours. View More.. The superstars have been failing on a regular basis to deliver, notwithstanding their Eid, Diwali, Christmas and other festival release dates, not to mention 4000+screens and enhanced ticket rates! Anything goes in the name of stunts -- and the special effects will do the job, is not working anymore. View More..
Mumbai, March 17 (IANS) After spending months in New York battling cancer, actress Sonali Bendre Behl is celebrating her "new normal" life with her family and friends. View More.. The superstars have been failing on a regular basis to deliver notwithstanding their Eid, Diwali, Christmas and other festival release dates not to mention 4000+ screens and enhanced ticket rates! Anything goes in the name of stunts and the special effects will do the job is not working anymore! So, now is the time to turn to content oriented films. When a maker has solid content, a superstar is not needed. Of the reigning but 50+ superstars, only Aamir Khan seems to have realized this fact! Or, so his film Dangal and his portrayal of a determined Haryanvi father, wanting to turn his daughters into world class wrestling champs, has proved! View More..
New Delhi, March 10 (IANS) Interior designer and entrepreneur Sussanne Khan says her mother and sisters have been key players in her life, but she seeks inspiration from her children. View More..
Chennai, March 2 (IANS) Actress Tamannaah Bhatia, who has a no on-screen kissing clause in her film contracts, is ready to break the policy for actor Hrithik Roshan. View More..
Gurugram, March 1 (IANS) Actress Vaani Kapoor has no regrets when it comes to her professional decisions, and says she is happy about her choices. View More..
Mumbai, Feb 15 (IANS) Celebrities like Amitabh Bachchan, Lata Mangeshkar and Rajinikanth have condemned the terror attack on the Central Reserve Police Force (CRPF) troopers in Jammu and Kashmir's Pulwama district. View More..
Mumbai, Feb 15 (IANS) From Amitabh Bachchan to Lata Mangeshkar and Shah Rukh Khan, a string of Bollywood celebrities took to social media to condemn the terror attack in Jammu and Kashmir's Pulwama district, which killed 45 Central Reserve Police Force (CRPF) troopers. View More..
Mumbai, Feb 13 (IANS) Vaani Kapoor says she wants to show her versatility as an actress in her upcoming films. View More..
New Delhi, Feb 1 (IANS) Interior designer and entrepreneur Sussanne Khan says many people know her as the former wife of actor Hrithik Roshan, but her identity goes beyond that. View More..
M0umbai, Jan 30 (IANS) Actress Vaani Kapoor, who was last seen in "Befikre", says trolling has become a norm of the social media. View More..
Mumbai, Jan 29 (IANS) Actor Tiger Shroff, who delivered a successful film in "Baaghi 2" in 2018, says he is under pressure for his forthcoming releases that include "Student of The Year 2" and "Baaghi 3". View More..
Mumbai, Jan 23 (IANS) Actor Tiger Shroff has praised actor Hrithik Roshan, whom he will be seen sharing screen space with in an upcoming actioner and said that he is looking even better and younger now than he did in his debut film "Kaho Na Pyaar Hai", which released almost two decades ago. View More..
Mumbai, Jan 14 (IANS) Actress Priya Prakash Warrier, who is gearing up for the release of her upcoming film "Sridevi Bungalow", says she wanted to become a part of Rohit Shetty's "Simmba" along with Ranveer Singh. View More..
Mumbai, Jan 11 (IANS) Filmmaker Rakesh Roshan is up and about after undergoing surgery for an early stage of throat cancer, his actor son Hrithik Roshan has said. View More..
Mumbai, Jan 10 (IANS) As actor Hrithik Roshan turned 45 on Thursday, his former wife Sussanne Khan called him her "best friend forever" and "soulmate", even as several others from the film fraternity wished the "great son" and "extraordinary father" all the best. View More..